When it comes to formal occasions, nothing quite beats Italian tailoring and this classic suit from Dolce & Gabbana ticks all the style boxes. 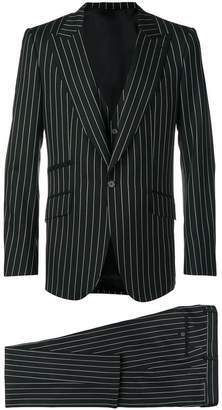 Fashioned in Italy from stretch virgin wool, this black pinstriped three-piece suit from Dolce & Gabbana features a jacket with peaked lapels, a front button fastening, front flap pockets, long sleeves with button cuffs and a rear central vent. The tailored slim-fit trousers boast a waistband with belt loops, a concealed front fastening, side pockets, two back buttoned welt pockets and a regular length. Finally, the suit comes with a matching waistcoat featuring a front button fastening and welt pockets.